Jing Hong Okorn-Kuo (centre), the Korean sister-maids (left) and Irish sister-maids (right). An international collaboration of award-winning artists from three companies The Llanarth Group (Wales), Gaitkrash (Cork, Ireland), Theatre P'yut (Seoul, Korea) with independent artists from Singapore and Ireland/UK, directed by Phillip Zarrilli with dramaturg Kaite O'Reilly. Anyone who hasn’t experienced the ecstasy of betrayal knows nothing about ecstasy at all (Jean Genet). playing 'the maids' explores the dynamics of power and servitude, wealth-as-privilege, and the politics of intimacy in a globalized world. 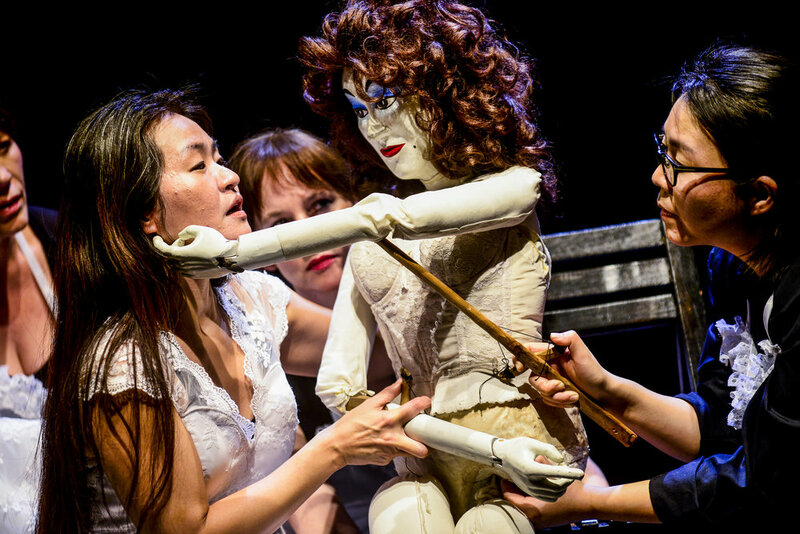 Expect the unexpected as two pairs of sister-maids (Irish and Korean), a Chinese ‘madame’, a sound artist, and a cellist weave together a rich web of music, new text, movement, and gestural languages to create a compelling theatrical experience, inspired by Jean Genet’s classic The Maids. Mae chwarae ‘y morynion’ yn archwilio deinamig grym a chaethiwed, cyfoeth-fel-braint, a gwleidyddiaeth cyfeillach mewn byd wedi globaleiddio. Disgwyliwch yr annisgwyl wrth i ddau bâr o chwiorydd-forynion (Gwyddelig a Choreaidd),’madame’ Tsieineaidd, artist sain a soddgrythwr wau ynghyd gwe gyfoethog o gerddoriaeth, testun newydd, symudiadau a iaith ystumiol i greu profiad theatraidd cymhellol, wedi ysbrydoli gan glasur Jean Genet The Maids. Informed by the recent and ongoing economic downturn in Europe/UK, and the boom in China, South East, and East Asia, playing 'the maids' explores the dynamics of power and servitude, wealth-as-privilege, and the politics of intimacy in this seventy-five minute performance combining live music, text and movement/choreography. 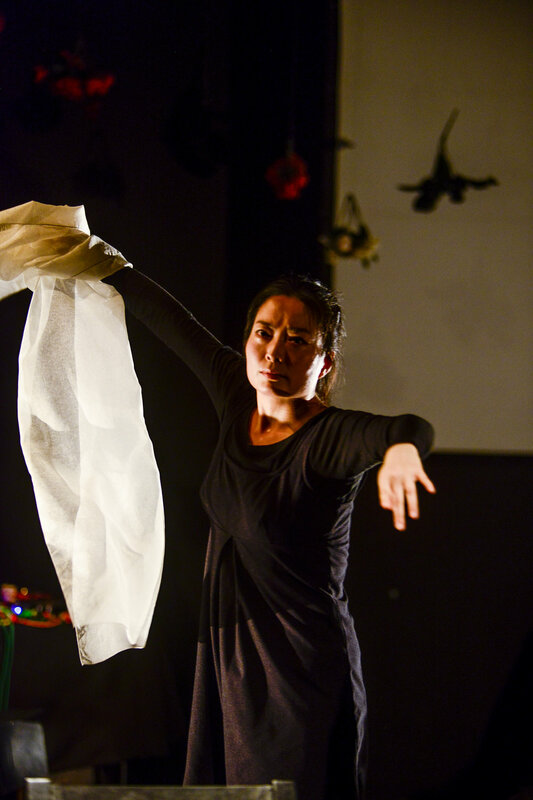 Two pairs of maids –one Irish (Bernadette Cronin; Regina Crowley) and the other Korean (Jeungsook Yoo; Sunhee Kim), a Chinese Madame (Jing Hong Okorn-Kuo), a sound artist (Mick O'Shea), and a cellist (Adrian Curtin) weave together a rich web of musical, textual and gestural languages to create a compelling theatrical experience, inspired by but NOT a production of Jean Genet's classic The Maids. playing 'the maids' was developed with Arts Council Wales funding in 2013, further developed in June 2014 in Cork, Ireland with five invited previews performed on invitation of The Cork Midsummer Festival 20-21 June at the Granary Theatre. The work premiered in 2015 at Chapter Arts Centre and is available for touring. Sunhee Kim and Jeungsook Yoo (the Korean sister-maids). The Irish Sister-Maids: Bernadette Cronin reads to her 'sister', Regina Crowley from a 'Miniature Lives of the Saints' storybook for children. Accompanied by the musicians, Madame sings a popular Chinese love song. Whereas, near the end of the play, Jing Hong Okorn-Kuo as Madame, immaculately dressed and poised, embodies the glamour of tyranny asshe pronounces: ‘While in Hong Kong, or Singapore being served canapés and champagne by white-gloved waiters in white and gold uniforms, have you ever selected your next London apartment just for the view along the Thames?’ It is in moments like these, contrasting the vast wealth that is accumulating within narrow sections of the Asian economies with the new paradigm of austerity that is plaguing the West, that you can sense just how the tectonic plates of the world economy have discernibly (and possibly irrevocably) shifted. Madame taunts one of her maids.